…find out which UK universities excel when it comes to keeping employees content – from pay levels to recognition of the extra hours staff put in. We also want to know how the experience of working in a university differs according to role, discipline, level of seniority, age, gender, terms of contract and other variables. Having just been made redundant by a higher education institution after sixteen years service, and having watched that institution comprehensively dismantle a highly rated and internationally recognised academic practice department, I think it’s fair to say that I was rather keen on contributing to the survey. Sadly, when I went to complete the survey I discovered that it’s restricted to current academic staff with a .ac.uk email address. No .ac.uk mail address, no submission, and ironically my institutional address had been shut down earlier that afternoon. Not only are ex-academic staff who no longer have a .ac.uk e-mail address prevented from responding, the survey is also constructed in such a way that respondents are encouraged submit data that relates to their current institution, rather than previous institutions they may have worked for. Although I can understand why THE has restricted the survey in this way, it’s a relatively simple way to authenticate submissions, I do think they are rather missing a trick. Given the amount of flux in the sector at present, I think it would be invaluable to record the experiences of staff who have been made redundant, jumped before they were pushed, or simply moved on to greener pastures. THE have always proved to be very responsive on twitter, so I tweeted this suggestion to @timeshighered last night and was gratified to have an almost immediate response from THE journalist Chris Parr. 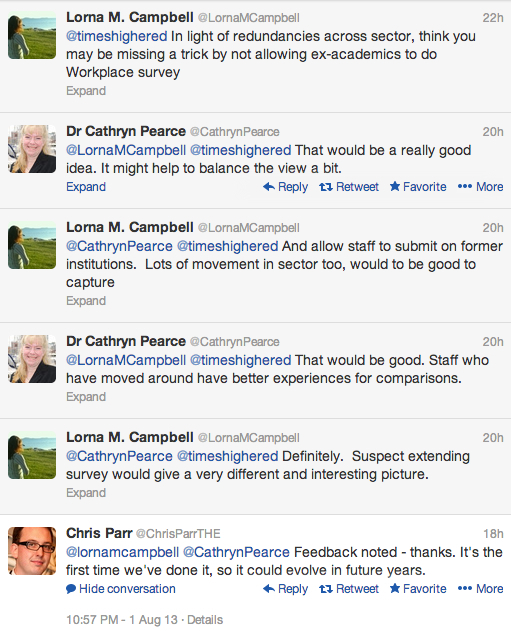 Thanks also to Dr Cathryn Pearce for joining the debate. I hope THE Best University Workplace survey is sufficiently successful for an updated version to run in subsequent years. Setting these quibbles aside, I think the survey is an excellent idea, and I’ll certainly be very interested to see the results. I’d also encourage colleagues to take a few minutes to complete the survey. Go on, you know you really want to tell THE how much you love, or loathe, your institution! This entry was posted in higher education and tagged higher education. Bookmark the permalink.